How can you make your shopping during the holidays more than just a gift--but something that might actually improve lives around the world? Los Angeles-based Enrou (www.enrou.co) thinks it has a way--by connecting people with products that also help support international development and causes, via its own online marketplace. We spoke with Ann Wang, co-founder of Enrou, to learn more about how the company wants to help tie together the world of e-commerce and worthy causes to help improve the world. 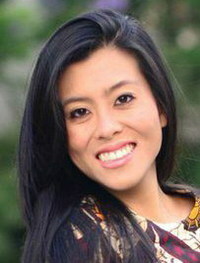 Ann Wang: Enrou is an online, content driven marketplace for products in developing communities around the world. It's really about empowering consumers and individuals, and anybody who wants to be able to reduce global poverty in their every day life, with something as simple as purchasing a product, gift or other item you love. Right now, we're all online, where you can find beautiful jewelry created in Laos to home goods created in Uganda. We're a lifestyle brand similar to Anthropologie, with a strong focus on international development and global justice. Ann Wang: My background is in international development, where I had worked with a lot of organizations around the world. I saw that there was a big passion within the millennial generation, who wanted to create a better world. However, a lot of people didn't know how, because they have no means or resources to buy a ticket to Africa, or how to do things except spend their whole life donating to charities. I saw that there was an overall desire to create and impact the world in their everyday life. That's really what I wanted, and what I saw that my friends and the community wanted. I had worked along with some of these organization son the ground, who were employing people, providing microfinancing, education, and help. I saw that they were employing local people, providing them with a capacity to earn, but also that they needed a way to get to market. They were doing great work, but they had no e-commerce or marketing team to get them out there. That's where we entered the scene, as a platform for that particular type of organization. How do you work with those organizations? Ann Wang: For example, we partner with one of the brands called Hiptipico, which is based out of Guatemala. They help train and employ the local community where they are working, with women who create beautiful backpacks and clothing and other different items. They provide training and support for those women, as well as paying them an income and supporting them with capital to create the product. If you look at our causes, is all of our brands are focused not just about capacity for an individual, but also to help provide infrastructure for the community. Hiptico also has a Mayan education fund, a great fund they support through purchases, to help put the children of the artisans into school with scholarships. If you look at all of our brands, they have to have those two items, one, help an individual become employed and supported, and number two, provide additional programs that grow that individual and the community. How did you get together with your cofounder? Ann Wang: Jess and I have known each other since we were thirteen. We went to junior high school and UCLA together. We were both in college when we came up with the idea. We were seniors at UCLA, and both of us in very different areas. I was in international development, she was a communications major. We were both very good friends, living together, and we came up with the idea and thought this could go everywhere. We talked to people in the industry, our friends, and our family, anyone we could get ten minutes with and asked them if they thought this idea could stick. After a couple of months, we realized there was something special about this, and starting building a team, and tackled the website and partnerships. We had a soft launch last year in November, to start testing the content and products, which we find are impactful and resonating with consumers. We are looking forward to a national launch in 2015. Neither of your founders are technical, did you find that difficult to get this up and running given that lack of a background? Ann Wang: It was definitely a struggle at the very beginning. We really didn't know our options on how to build something like this. But, we had a strong vision, and knew we wanted to get there. What happened is we have some very good friends with amazing talent. We had a hugely talented, full time staff developer i had known through a previous job, who jumped on board and helped us build out both the back and front end. I also have a very good friend who is a UX designer, and she really had a great eye for the brand we wanted to build. We stumbled upon another person, who is still our main creative director and designer. It was hard, and we knew we couldn't do this without a great website, and we were very strong about wanting to look like a very well developed company even for our soft launch. We just got really lucky with a great team and building it. Ann Wang: Thanks to the recent Forbes competition, and a lot of momentum from that, we actually are opening up a round for seed funding in the next month or two. We have had a lot of great conversations, both before the competition and during the competition, and we now have some new conversations that are really exciting. We're now releasing a brand new look to our collection, with new stories and impacts and people, and of course amazing products. We'll be pushing that and showing proof of our campaigns leading into the holidays, engaging our current customer base, and we'll have a pretty big launch of Enrou on the national level during the Spring of 2015.